That’s a lot of LEDs, and a little bit of glass cleaner. [Tobias] spiced up his IKEA coffee table by adding 6144 LEDs. 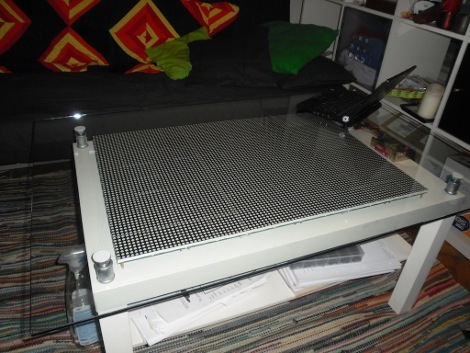 This is a larger realization of SparkFun’s LED coffee table which used 64 8×8 modules. [Tobias] sourced three display boards from Sure Electronics for a total of 96 8×8 modules. These boards are addressed through a serial interface; four serial lines for each board but a shared data bus for each of the row select pins and the data/latch/clock pins. This method uses 19 of the 20 pins on the Arduino that drives the display. After the break you can see a demonstration. If this is more than you need there’s always the 112-LED and 81-LED table projects that can produce a full color range. Truly epic…always wanted to do something awesome with those Sure LED panels! I dunno. I like LED displays as much as the next guy, but as you up the resolution at some point I think it just starts looking like a low-res monitor and loses much of the charm. so he didn’t have to solder 12,288 connections? So is this, but I agree with the comments about it being rather low res. Yes, there were some builds with similar concepts in an issue of c’t (german computer magazine) some years ago. Would be pretty cool for audio visualizations. wow, haven’t seen this before. He should really use the SPI bus for this sort of thing. One thing I don’t get, the link to that sureelectronics shop is for a red led panel, the used panels are clearly not only red. Why not have is display your favourite RSS feed or some primative video games, thats it giant pong clock coffee table! Sad that it’s only red/green, those are decent prices for serial based LED panels. @BiOzZ they didn’t have to, the display panels handle that for you. They just sent data to them in serial. @gbpic I agree, but he clearly didn’t have a choice, the display panels have their own interface. this one does basic ansi, but also provides TV-out and PS/2 input. Shame it’s not RGB, but it is still pretty cool. What I would do is salvage a couple of diffuser sheets from a busted LCD TV and lay them on top of the LEDs. It would be great to create procedural effects on that thing, ranging from game of life to nice vortex and “plasma” stuff. @Lou Skunt: I’m interested to see what projects you have undertaken so far? …who has a coffee table anyway? @jeditalian yes they have! and they are multitouch, check out nuigroup for all of your laid on back flat screen multitouch coffee table goodness! Buy a monitor for 1/5th the money, screw it under the table, if you prefer low res write a driver that displays virtual LED on it or slam a grid on it to obscure the full resolution. It’s not a “coffee” table, you’d never put a coffee mug down on that thing! More of a shin-hacker, did you see the overhang on the glass? Great table tho, would also love to see it RGB for ambient effects! How many more LED tables is HaD going to cover? how much would this cost roughly? ive wanted to build an LED coffee table/wall panel for a while now, they seem to be getting better. what would be a decent resource for learning to multiplex these type of panels?